Posted on Fri, Mar 9, 2012 : 11:45 a.m. The Common Cup Coffeehouse — today's Frugal Floozie Friday feature - describes itself as "An eclectic escape located on the ground floor of University Lutheran Chapel ... serving the caffeine needs of the campus community." And serving the community well, I might add! The cafe is a welcoming space, physically, with comfy chairs, tables to work at, wifi, and shelves of board games ready to provide hours of entertainment; whether you're working or socializing or relaxing, you are encouraged to stay awhile. And the place is most inviting because of its friendly staff. I stopped by on a recent afternoon in search of a bit of serenity and chocolate after a stressful day. If I hadn't already known I needed cocoa, my brain would have experienced its usual "menu paralysis" when faced with too many enticing choices. But hot chocolate was already on the agenda before I'd even walked through the door, and the cookie assortment placed so temptingly right in front of me on the counter made my decision-making process much easier. 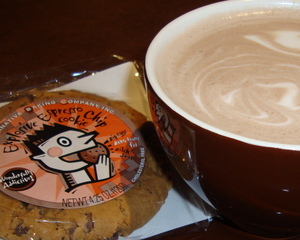 For less than $5 — our mandatory Frugal Floozie Friday per-person budget — I was able to enjoy a huge mug of rich, frothy cocoa accompanied by a large, chewy vegan espresso chip cookie ... a perfect solace. Stadium Market provides sandwiches, salads, stromboli and other hearty food if you're seeking something more substantial than restorative treats. Common Cup's beverage menu is fairly extensive, offering a wide variety of both hot and cold drinks.Your coffee can be prepared with a French press or as a drip brew or a pour over, and the usual assortment of lattes, espresso, and chai is offered. There are blended drinks and smoothies if you want something cool and refreshing, and Coke products as well as French and Italian sodas are available. Virtually all of these cost less than $5, and the small sizes, in some cases, cost less than $2. The cafe offers locally-roasted coffees, as well as providing a home for area artists to showcase their talents, whether they create pictures that are displayed on the walls or are musicians who perform in the evening. The management also thinks globally and is a supporter of Union MicroFinanza (UMF); a display table offered bags of coffee beans grown in Honduras that were available for purchase at $10 per bag. Because the coffeehouse is located within a church, there are copies of the Bible and a copy of the Lutheran Service Book on the shelves; but there is nothing else particularly overtly religious, and even these books were tucked to the side of the doorway rather than displayed prominently. Common Cup's purpose is to invite and welcome, rather than to proselytize. As you rush up and down Washtenaw Avenue in your busy lives, be sure to stop in the serene Common Cup Coffeehouse for a bit of respite from all the bustling. Enjoy a few moments of peace and serenity while satisfying your caffeine needs. Common Cup Coffeehouse 1511 Washtenaw Ann Arbor, MI 48104 734-327-6914 Monday - Friday: 8:30 a.m.-10 p.m. Saturday: noon-5 p.m. Sunday: 9 a.m.-9 p.m.
Fri, Mar 9, 2012 : 9:40 p.m.
Have really enjoyed my visits to Common Cup. Those cookies (like the one pictured, Alternative Baking Co.) are delicious! Sat, Mar 10, 2012 : 2:42 p.m.